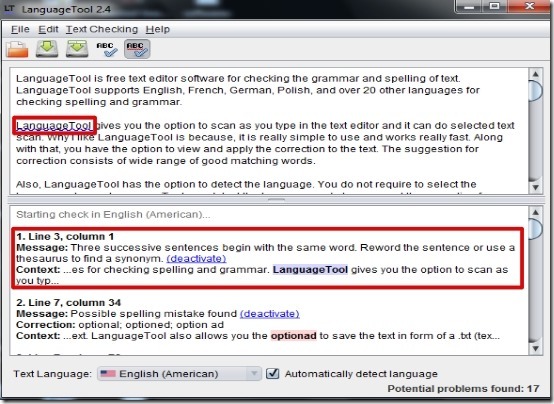 LanguageTool is free text editor software for checking the grammar and spelling of text. 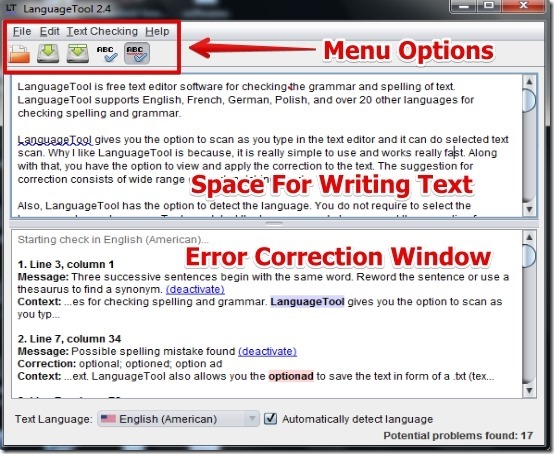 LanguageTool supports English, French, German, Polish, and over 20 other languages for checking spelling and grammar. LanguageTool gives you the option to scan for mistakes as you type in the text editor and it can also do selected text scan. Why I like LanguageTool is because, it is really simple to use and works really fast. Along with that, you have the option to view and apply the correction to the text. The suggestion for correction consists of wide range of good matching words. 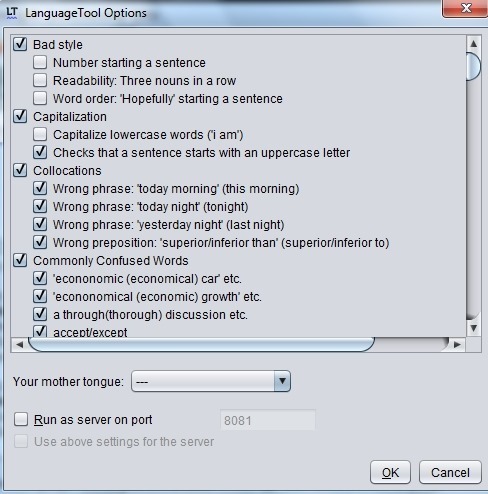 Also, LanguageTool has the option to detect the language. 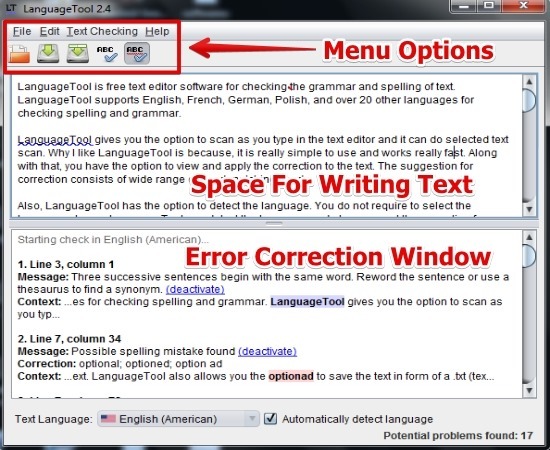 You do not require to select the language always; LanguageTool can detect the language and also suggest the correction for any errors in the text. LanguageTool also allows you the option to save the text in form of a .txt (text) file. It is a really good feature that makes the edited text compatible with other software that support text file format. I have tested LanguageTool standalone version for Windows 7 and it worked well for me. Though, LanguageTool is available for LibreOffice, OpenOffice; and as an extension for Firefox web browser. I have provided the download link at the end of this article. LanguageTool is very simple to use. In the user interface you have to just type in the text and the mistakes appear neatly in the bottom of the screen. I like that the wrong text is highlighted and you can see the correction suggestion along with the line and column in a separate window. You can correct individual words by right clicking on them. After you are done with the grammar and spell checker, you can save your work in text file. I really like that LanguageTool allows you to edit the rules for grammar and spell checking. You can edit the rules from Text Checking – > Options. Below, I have posted a screenshot in which you can see the option to edit grammar and spell checker rules. Note that LanguageTool requires Java to work. Good compatibility: File can be saved as .txt format. Option to enable/disable scan as you type option. Option to set rules for the grammar and spell checking. Option to detect the language automatically. Support for large number of languages. Number of potential problems are shown. You might want to try similar software Jotx. 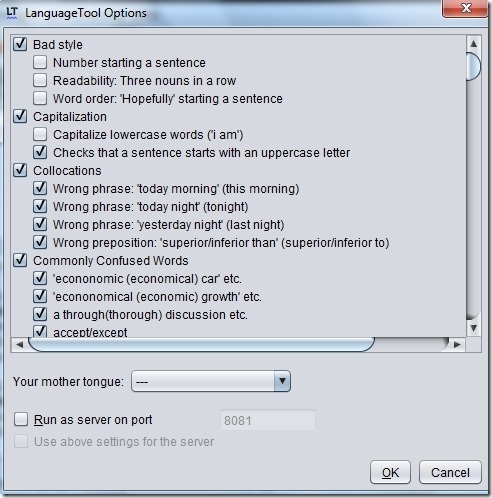 LanguageTool is very simple to use and it works good as a grammar and spell checker. I like that the corrections are highlighted by crisscross underlines along with the good correction suggestions. However, I missed the option to edit the words all at once like in MS Word. 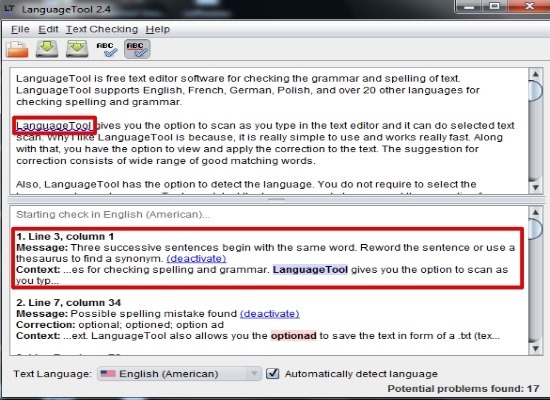 Overall, I like LanguageTool as grammar and spell checker tool.